‘The Big Five’ includes the lion, leopard, elephant, rhino and buffalo. They are the most impressive mammals that can be seen on safari in Africa. The Big Five have captured the imaginations of visitors to Africa for centuries. You would only need one encounter with a member of this imposing quintet to understand why. Luckily, your Big Five safari will offer numerous opportunities for sightings. Due to threats to their environments and the scourge of poaching, the range of the Big Five is not as auspicious as it once was. However, through the dedicated efforts of conservationists, you can still enjoy an authentic Big Five safari in many pockets of Southern Africa. Lions are distinctly social animals that are typically spotted in prides. Males boast handsome manes in varying shades. Females are known for their athleticism and efficient hunting skills. They are Africa's largest and most feared predators. 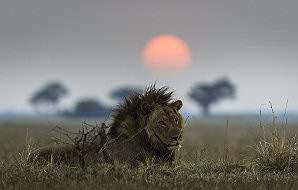 Lions occur in most of Southern Africa’s popular wilderness areas, like the Okavango Delta, Chobe, Etosha and South Africa’s many national parks and private game reserves. 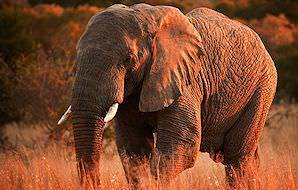 The world's largest mammal can be seen in all of the primary safari areas of Southern Africa. Females and their young are typically spotted in herds led by a matriarch. Male elephants are normally found in small bachelor herds or as solitary bulls once mature. 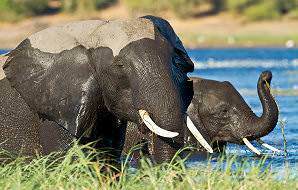 Visitors to the Okavango Delta or Chobe National Park are near guaranteed to enjoy in-depth elephant encounters whilst on safari. 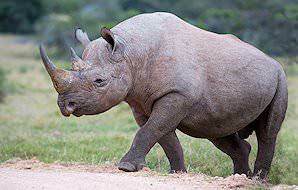 Although the black rhino is the original ‘Big Five’ member, somewhere along the line the status unofficially extended to include the white rhino as well. Black and white rhinos are distinguished by their shape and size, but perhaps more distinctly by their diets; black rhinos are browsers, as indicated by their pointier, hooked upper lips, while white rhinos graze comfortably with their broader, square-shaped upper lips. Cape buffaloes are regularly observed in very large herds. Alternatively, young males are found in bachelor herds and old bulls that have been kicked out are often seen grazing together at the back of the herd. They are known as 'dugga boys'. In rarer cases, they wander alone. 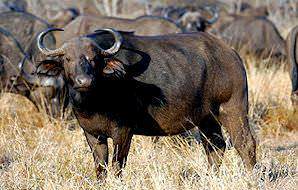 Buffaloes are also the only members of the Big Five that aren’t listed as ‘threatened’, ‘vulnerable’ or ‘endangered’ on the IUCN red list. 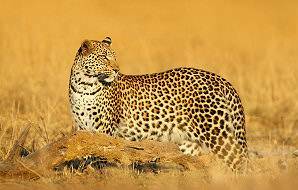 Leopards are elusive, solitary cats and are less frequently encountered than the rest of the Big Five, which makes a sighting particularly special. 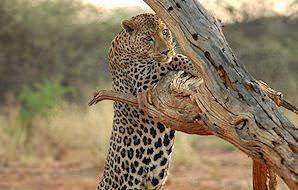 Leopards are known to drag their kills up into trees to deter scavengers. They typically prey on smaller antelope, but are opportunistic hunters and will not shy from taking down larger game. These handsome, spotted cats are typically encountered alone or with their young. Enjoy Big Five safaris from a base in a private concession within the heart of the Kruger National Park. Accommodation is at four star lodges. An exclusive five star safari experience that combines the Sabi Sand and Phinda private game reserves - two prime Big Five wilderness areas. Explore South Africa's Big Five-bearing national parks on a comprehensive private overland safari, which includes Kruger, Addo, Pilanesberg and Hluhluwe. The grandest and most exclusive of our safaris. Visit Big Five wilderness areas in South Africa and Botswana along with Victoria Falls and Cape Town. Big Five encounters are all characterized by one thing: awe. Awe at the stealth and beauty of the leopard, awe at the gentility of the giant elephant, awe at the fierce majesty and hunting prowess of a pride of lions, awe at the almost casual yet commanding power of a herd of Cape buffalo, and awe at the almost prehistoric appearance of the endangered rhino. Where you find the continent's supreme five animals, you will also find the continent's ultimate lodges. 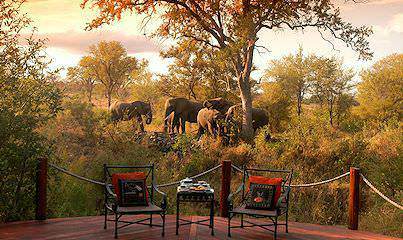 The safari areas need to be first-class to sustain such majesty, and the lodges they host are of equal stature. Here you can not only relish encounters with these amazing animals, but also captivating wilderness areas and lavish accommodations. If the photographs of your safari involve the Big Five, they will automatically become all the more memorable. A leopard stalking through the bush, or high up in a tree; a family of elephants crossing a river or gamboling in the current; a tender moment between a lioness and her cubs; an army of buffalo blocking out the landscape with their black bodies - photographic opportunities abound. 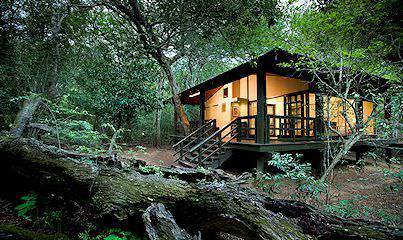 The private game reserves are known for their ultra-luxurious lodgings. Along with your plush accommodations, however, you will enjoy the company of an experienced ranger (and often a tracker as well) during your game drives, ensuring unforgettable sightings of the Big Five. Sabi Sand boasts the highest frequency of leopard sightings on the continent. Less lodges, and yet the same inimitable wildlife as Sabi Sand and Kruger. A unique wilderness characterized by captivating environmental diversity. Shamwari offers luxury Big Five safaris in a malaria-free wilderness. South Africa's Big Five-bearing national parks are timeless, authentically wild spaces where you can enjoy a guided overland safari that offers great value for money. The Big Five roam these breathtaking landscapes in significant numbers, augmenting your chances of sightings. Kruger is South Africa's largest and most prolific national park. Hluhluwe-iMfolozi is a conservation nerve center and the oldest park in South Africa. Addo comprises a malaria-free wilderness in South Africa's Eastern Cape. Madikwe is a reclaimed wilderness with lavish family-appropriate accommodations. 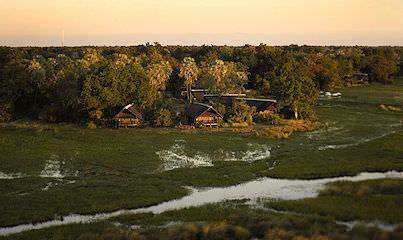 Botswana boasts inimitable, authentic wilderness areas. 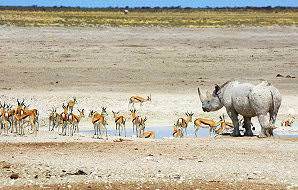 Currently, rhinos only occur on Chief's Island in the Okavango Delta's Moremi Game Reserve. You are highly likely to encounter the remaining four members in healthy numbers in the Chobe National Park, Savute safari area, Linyanti swamp and the Okavango Delta. Etosha National Park is home to all but the Cape buffalo, and it remains one of the finest corners of the continent to encounter endangered black rhino. Lions and elephants are also frequently sighted, while the leopard remains as elusive and shy (yet still as common) here as elsewhere in Southern Africa. Zambia's wilderness areas are dramatically remote and truly wild. Four of the Big Five - leopard, lion, buffalo and elephant - occur in generous populations in its stunning national parks, like South Luangwa, Kafue and Lower Zambezi. To view rhinos, visitors can head to the Mosi-oa-Tunya National Park near Livingstone. In Zimbabwe, the Big Five still reigns supreme in Hwange National Park, while four of the Big Five (no rhinos, unfortunately) roam the breathtaking wilderness of Mana Pools. These are Zimbabwe's premier safari areas and the regions where you are most likely to encounter these majestic mammals. Rampant poaching and the side effects of the civil war mean that Mozambique's wildlife population has been severely depleted. Cape buffalo and leopard still occur in large numbers, however, in Niassa, while Gorongosa National Park hosts elephants and lions. With dedicated efforts, Mozambique's wildlife may one day be restored. Lionesses are incredibly efficient hunters, and watching these lithe cats work as a team to bring down their quarry is a thrilling experience. If they are successful, get comfortable - lions can feast for quite some time, and you'll want to be there when the cubs arrive for their share of the meal. 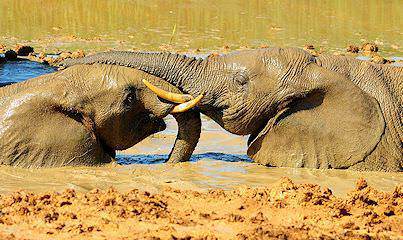 These gentle giants are remarkably sensitive creatures who often share tender moments. It is very pleasant to spend some time observing a family of elephants, learning about the unique relationship structures within the herds. Elephant calves are particularly delightful to observe. As their numbers continue to dwindle, rhino encounters become all the more precious - regardless of which species (white or black) it may be. Rhinos with calves are always more wary and protective, but witnessing their affectionate interactions will provide lasting memories. Where is the best place to enjoy a Big Five safari? South Africa's Greater Kruger National Park (including the park itself and the private game reserves that share an unfenced border with it) is the top Big Five destination on the continent. Will it be dangerous to come into contact with the Big Five? No, as long as you always heed the advice of your ranger. Do not approach ANY wild animals by yourself (Big Five or not), keep your voice low and calm during sightings and avoid sudden movements that would alter the shape of the game viewing vehicle. Why are rhinos limited to only a handful of safari areas? Due to rampant poaching (as the result of the high demand for illegal rhino horn on the black market), rhino numbers have dwindled severely. These majestic animals are now highly endangered. Could I see the Big Five on a walking safari? The herbivores - buffalo, elephant and rhino - are occasionally encountered on walking safaris and observed at a safe distance. 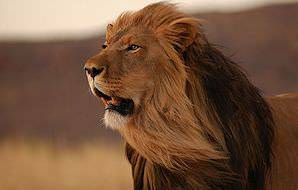 Which member of the Big Five is most commonly encountered? Elephants have healthy populations across Southern Africa and are the most commonly encountered members of the Big Five. Which member of the Big Five is the most difficult to spot? Despite the dwindling numbers of the rhino, the elusive leopard remains the most difficult member of the Big Five to spot. This is largely due to its shy, solitary nature and fantastic camouflage abilities. Will I see the full Big Five contingent during my safari? 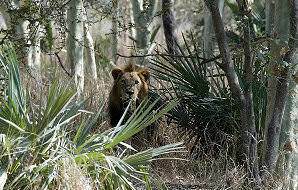 Should you be visiting an area with a high density of wildlife, your odds are very good. However, these are wild animals, and you are not visiting a zoo - your sightings are dependent on their movements. Which member of the Big Five is the most fearsome? It depends on who you ask, but most rangers will refer to the Cape buffalo as being the most unpredictable and therefore the most dangerous member of the Big Five. Who chose the Big Five, and why were they named as such? The Big Five were chosen and named by the big game hunters of yesteryear. These animals were determined as the most difficult and dangerous to hunt on foot. If a safari area does not have all of the Big Five, is it still worth visiting? Yes - there is much more to an African safari than the Big Five. So many other captivating creatures inhabit the continent's wilderness areas, and so many spectacular backdrops would be missed if travelers focused on the Big Five alone. Travel to South Africa for the ultimate Big Five safari experience. Botswana's safari areas are remarkably pristine and offer unique safari activities. Namibia is famous for its spectacular desert scenery and sparkling night skies. Zambia's national parks are spectacularly wild and remote, like Kafue and South Luangwa. Zimbabwe is home to the awe-inspiring natural drama of the Victoria Falls. Mozambique's beaches and islands are the stuff of vacation dreams. The Kruger National Park's diversity is legendary amongst safari enthusiasts, boasting 147 different species of mammals. Our luxury safaris combine exceptional game viewing and stunning wilderness areas with sumptuous accommodations. The Big Five are the continent's most awe-inspiring mammals and include the lion, leopard, elephant, black rhino and Cape buffalo. The African lodges included in our safari packages range from intimate tented camps to extravagant safari palaces.